The Gibb River Road - Australia - Do I need a permit? Righto here’s the info links to the permits needed for Mitchell Falls and Kalumburu. Both are run by separate Aboriginal corporations as they are in two separate tribal areas. There are two different types of permits required to enter and stay in the Kalumburu region. 1) The FIRST is a FREE tourist ‘transit’ permit obtained online at the link below. Only ONE permit per car is required, but please enter the names of each of the passengers on the online application. In most cases the permit is issued immediately automatically. 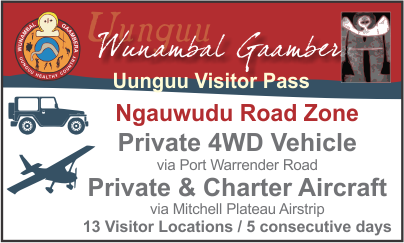 2) The SECOND is the $50 PER CAR (or motorbike) Yellow tourist permit (see pic below) to stay on Kalumburu Aboriginal Corporation land. Each permit has its own serial number that is cross-referenced with a particular car rego number when the rangers come and check - so it must be left clearly visible on your dashboard. This permit can only be obtained in Kalumburu (at the main supermarket or CRC Tourist Info office next door) or at the two beach camps as a last resort if you enter town when the shops are closed. You WILL NOT BE ALLOWED TO STAY AT EITHER OF THE BEACH CAMPS OR IN THE KALUMBURU ACCOMMODATION PLACES WITHOUT THE YELLOW TOURIST PERMIT. ### Monies received from the permits go straight into community projects like subsidising the freight of fresh fruit and veggies that both locals and tourists utilise. 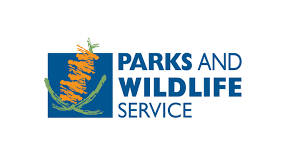 information PDF to let you know what these park fees are.